You knew this play was going to make it’s rounds on the Internet. Detroit Red Wings goaltender Dominik Hasek trips Minnesota Wild forward Marian Gaborik, and gets a penalty for it. Was Hasek in the wrong and being overzealous in his quest for a shutout? Or was Hasek in the right for stopping a breakaway? This is the latest brutal hit that is being talked about in the hockey world, and the first of this year being that it is still pre-season. 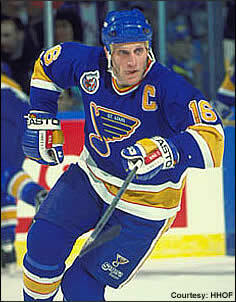 The St. Louis Blues retired Brett Hull’s #16 tonight, we had tickets but we’re both sick as all get out. So we didn’t go, but we did watch it on TV. For a long time, Brett Hull was the face for the St. Louis Blues. Towards the end of his career in St. Louis, many fans started to question his performance. It seemed lack luster, fans were wondering why he commanded such a high salary. The simple answer to Brett’s performance is Mike Keenan. That lousy excuse for a coach dessimated the St. Louis Blues team by trading off all the “stars” on the team. At any rate, Brett Hull and many of his old team mates came back tonight to see his number get retired – and it was awesome. Not only did he get his number retired, but the city is actually going to name a street after him.